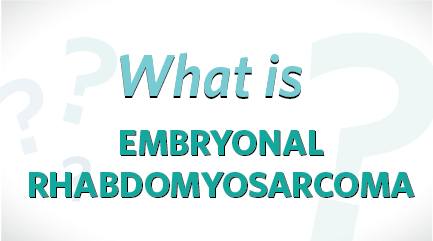 Embryonal rhabdomyosarcoma (ERMS) is a malignant soft tissue tumor that is formed from embryonic skeletal muscle tissue, the type of tissue that grows into skeletal muscles. When we think about skeletal muscles, we might first think of biceps or hamstrings, but embryonal rhabdomyosarcoma doesn’t usually start in the arms or legs. Most often, we see tumors in the head or neck, bladder, or reproductive organs. What are the signs and symptoms of embryonal rhabdomyosarcoma? In many cases, a quickly-growing tumor is what causes noticeable symptoms. Rhabdomyosarcomas have different symptoms depending on where the tumor grows. A tumor in the nose can cause nose bleed or sinus congestion. Behind the eye, a tumor can cause blurry vision and bulging of the eye. Within the bladder, a tumor can cause obstruction and as a result, difficulty in urinating. Tumors in the abdomen can cause pain, vomiting, and constipation. What treatment options are available for embryonal rhabdomyosarcoma? Children with embryonal rhabdomyosarcoma usually receive several different treatments that work together, including chemotherapy, surgery, and radiation. What is the current state of embryonal rhabdomyosarcoma research? With early diagnosis and treatment, 80% of children with embroyonal rhabdomyosarcoma will survive with today’s treatment options. But for kids whose tumors grow back, or when the cancer spreads to other areas of the body, we face a major challenge. As of now, there is still no effective targeted therapy for these children. We need to do more research on embryonal rhabdomyosarcoma cells to learn more about why tumors return and spread in order to create new and better treatment options for kids with this type of cancer. In June 2012, I received a three-year grant from St. Baldrick’s. With this grant, I am working to discover new drugs that will prevent cancer relapse in children with rhabdomyosarcoma by testing drugs to see how effective they can be at killing tumor cells, in hopes of keeping more kids cancer free. Whatever your talent, you have a place with St. Baldrick’s. Get involved today and together we can take childhood back from cancer.